As the sun comes out and the weather gets warmer, lots of us will be keen to get back into our gardens and tend to our patch. But for those with joint troubles, that's not always a welcome idea, even if you love gardening. In fact 74 per cent of people with joint pain said that they're missing out on the fruitful rewards of their cherished gardens because it's become just too painful with all that kneeling, digging and twisting putting pressure on joints. But the good news is that you don't have to abandon your gardening hobby altogether-there are plenty of ways you can relieve the pain of getting back to the great outdoors. If your painful joints are likely to scupper a long gardening to-do list, prioritise the most essential tasks to complete first. That way you can just focus on getting those done before the pain creeps in. It’s also best to tend to your garden little and often so you don't make joint pain worse by doing too much activity in one go. It can be hard to do, but asking for help when you need it will help save your joints from pain and get your garden how you like it. For any heavy work which is off limits, call on a friend, relative or even hire in someone professional to lend a hand. You can always offer to give them a cutting or the fruits of your crops in return. 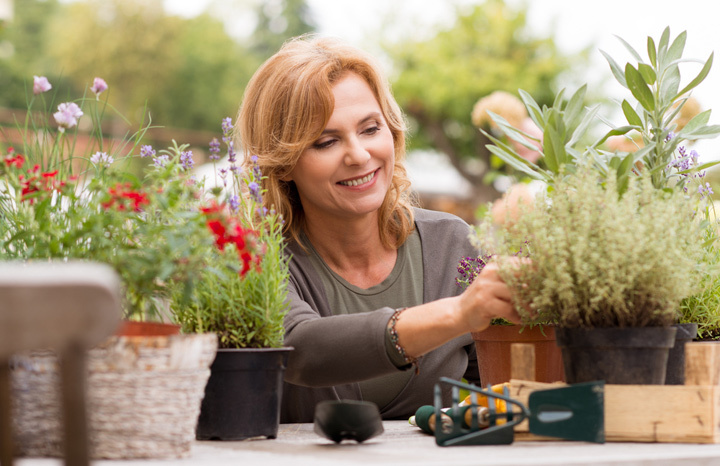 Taking a natural joint health supplement could help reduce your joint pain so you can carry on doing the things you love, like tending to your garden. Recent research has shown that GOPO, derived from the childhood favourite of rosehip (remember all that rosehip syrup we used to drink! ), can help improve joint pain, mobility and stiffness in arthritis sufferers. Other studies have also shown it to be good for people with joint pain and chronic lower back pain. Your tools, not you! Long handled tools will help you avoid bending down as often, while a soft spongy grip will help you grasp it more easily and wihtout straining your joints. Go for lightweight equipment and keep them in good condition to avoid putting in more effort than you really need to. If you struggle to kneel or bend down, try going for raised flower beds and planting boxes that will be easier to reach. Investing in a good garden stool could also help, but take care to avoid sitting on it for too long and getting stiff. There's more health or gardening advice in every issue of Yours magazine, out every fortnight on a Tuesday.